Even if you are not shooting for British-aristocracy level hedge sculpting, if you have hedges, they are going to need to be pruned at some point before they take over your entire yard. Hedge shears are a quick and efficient way to get this task done – read on to learn more about these fantastic gardening tools. What are Hedge Shears Used For? It is all in the name for hedge shears – these handy dandy yard tools are most appropriately used for pruning. They are often specifically designed to make very precise cuts, as it is typically very noticeable and not particularly aesthetically pleasing when hedges are not shaped at the minute level. They are also great at making precise cuts while still cutting a large quantity of plant matter at one time. Hedges tend to be very thick and have a lot of gnarled branches, so these are strong and powerful enough to chomp through many tough branches at once. 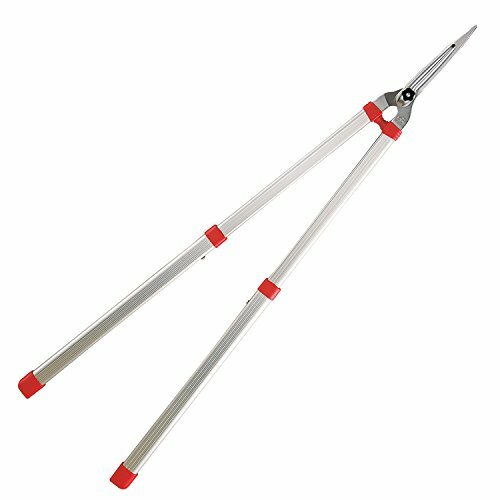 Because you will be using these to make very precise cuts, you need ones that you are going to be able to easily manipulate. The more simple the process is to get your shears into tight angles, the less time you will need to spend pruning. And the less time you need to spend pruning, the more time you be able to spend actually out in your yard enjoying the fruits of your labor! There is not really any way to get around actually carrying your hedge shears for the whole time you will spend pruning your hedges. High quality models typically have pretty hefty blades – the best will be designed to counterbalance that extra weight and make it so you are not exhausted after using them. There are also options that are specifically designed for use by older individuals and people with hand mobility issues, so if you are at all concerned about your ability to do intense yard work, you may be more drawn to those models. The thing about hedges is that they always grow back. Invest in a pair of shears that will last you for years and years, and many, many seasons of your hedge growing back in. This typically means looking out for options that are made of higher quality material, but it also requires some time investment on your part – make sure that no matter what you buy, you are taking the time to properly clean and store them to ensure they do not rust or degrade in any way. The Okatsune Precision Hedge Shears are probably the most ridiculously sharp option you will ever seen. Users report that using these is just like using a lightsaber! They are so sharp and handle so much of the work that even after extended periods of use, your arms will definitely not be sore. And this sharpness will actually last – many gardeners report that they only need to sharpen these once, at the beginning of their season, and then they are good to go for the rest of the year. The handle to blade angle on these bad boys makes for easy cut adjustment so you will be able to make the most precise cuts possible. Once you get the hang of them, they are great and extremely easy to use. They are also fairly lightweight for their size so it will not be too taxing for you to carry them around the yard with you as you are making your cuts. The Okatsune Precision Hedge Shears are, in a word, SHARP. These are so sharp you may want to wear gloves and make sure you do not have children or pets running around while you are outside using these. The ARS HS-KR1000 Shears are the ideal option to use when getting some pruning done manually. There are a number of qualities these have that put them head and shoulders above their competition when it comes to manual shear use. These have particularly long handles, meaning that users will not have to bend over so far when trying to use these to get to harder to reach areas down low. Additionally, these are on the larger side, with a wide mouth area when fully opened, so they can cut through a good amount of leaves with each closure. This quality makes for more efficient pruning and gardening. These are pretty much ideal for hand pruning – if you are looking for the best manual option on the market, you will not go wrong with the ARS HS-KR1000. The ARS HS-KR1000 are specifically designed to make life easier for those users interested in completing their pruning work by hand, with their long handles and wide mouth angle when open. They do rust easily, so make sure you thoroughly clean and dry them before putting them away after each use so that they will still be just as awesome in years of pruning and gardening to come. The Pine Tree Tools Professional Hedge Shears are really the premier option in professional options available on the market today. These are capable of making extreme precise cuts for users who are crafting shaped garden hedges. The length of the handles provide great leverage for getting into those trickier angles and cuts that may be harder to make. The shears are well made of high quality material and are guaranteed to last you a very long time. But just because these are utilized by professionals does not mean there is any difficulty inherent in using them – they are in fact quite simple to open and close and would be accessible to any user, even someone with no pruning or gardening experience. Just note that the blades do arrive super sharp – those new to gardening may be a little taken by surprise! The Pine Tree Tools Professional Hedge Shears are excellent shears for professional use, and are also a great choice for amateurs who just want a really great pair. Just keep a screwdriver on hand for tightening the screws holding the blade, as those do tend to loosen with age. Japan really seems to know what it is doing when it comes to making gardening tools, as anyone who has done any sort of even preliminary research into garden tool purchases could tell you. 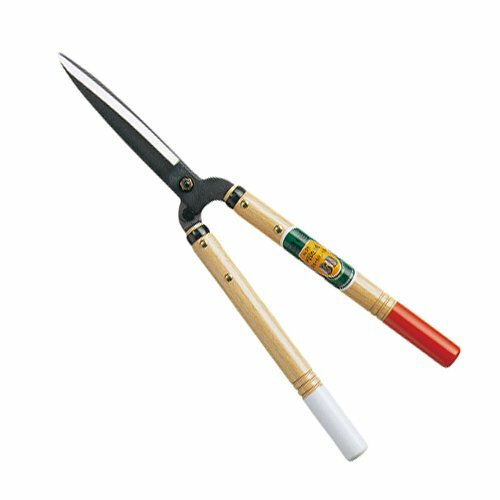 But when it comes to the crème de la crème of Japanese gardening tools, you will not be able to find better than the ARS 28- to 41-1/2-Inch HS-K900Z. These come with an awesome amenity that you will not be able to find on many other models – the handles on these bad boys extend, so they are awesome to use when you are standing at a distance from the cut you have to make. And there is definitely no compromise on quality: even when the handles are fully extended, you can still use these to cut through thick branches. This is due to the blades being made of high quality nickel plated hardened Japanese steel. These are so easy to use, they are even recommended for people with arthritis in their hands. The ARS 28- to 41-1/2-Inch HS-K900Z are an excellent pair of pruning shears that are accessible for anyone to use. The blades are shorter, but that is more than made up for with the extendable shear handles. If you have a ton of hedge that needs trimming, there is no better way to get it done quickly and efficiently than with an electric option. And if you are looking for a quick and efficient electric hedge shear, you will find it in the KOMOK Electric Pruning Shears. 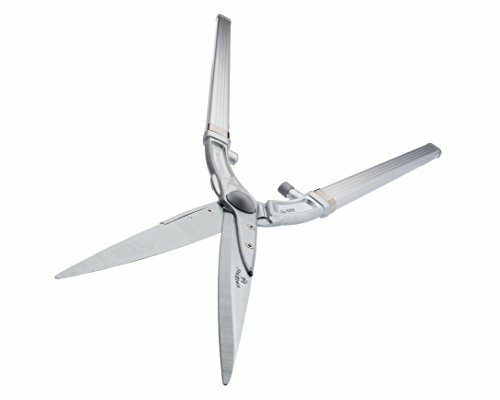 These shears are especially helpful for anyone who has any sort of hand mobility issue such as carpal tunnel syndrome. It can make a wide variety of cuts through different kinds of wood and limbs, and it can cut continuously for over five hours all on the same battery charge! These strike a good balance between producing sufficient cutting power without being too heavy, so really anyone can use them efficiently. They also come with a convenient carrying case so you can keep them, the charger, the spare blade, the blade cover, and the operating instructions all in one handy location. These are absolutely phenomenal and really set the standard for electric hedge shears. The KOMOK Electric Pruning Shears are fantastic, especially for those who cannot manually trim their hedges due to some hand mobility issues. They do tend to heat up after being used for a long time, so you should build some breaks into your pruning routine so that they can have a chance to cool down. ​Pruning Shears vs. Hedge Shears – What’s the Difference? Both are used for a type of pruning so…why should you buy one over the other? The answer is simple. Pruning shears are much smaller than hedge shears, and are designed for use more in gardens, such as to cut flowers for display. Hedge shears and pruning shears can definitely overlap in usage – for example, both types of shears would be effective in cutting a rose bush (up to a certain size). However, it would become tedious to use pruning shears to trim an entire hedge, and it would also probably be painful after a while. Hedge shears are better for large cutting projects. All will eventually become dull with enough use, no matter how sharp they were fresh out of the box. You should always sharpen your tools using a file for best results. Make sure your shears’ blade is firmly clamped into a vise. Take the file, and move it in one long, clean stroke away from you down the blade’s edge. You will be able to see the exposed factory edge of the blade being shorn away by the file if you are doing it properly. After about ten strokes from the file, the blade should be back to how sharp it was before it was ever used. Don’t forget to do the same thing for the other blade! There will be tiny burrs left on the back side of each blade from the file – these can be removed simply by sanding the backs of the blades with regular sandpaper. 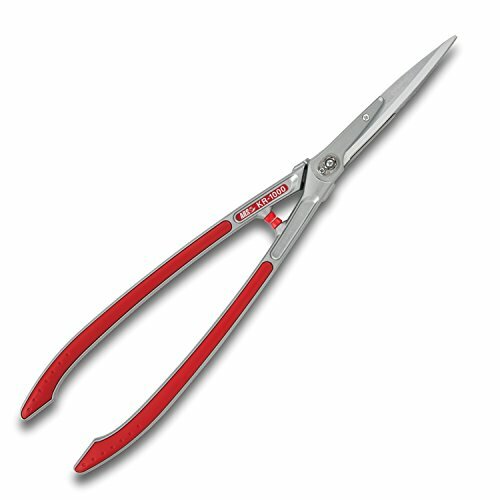 Hedge shears are a must for anyone that has hedges in their yard or garden. Check out the products we have listed here to find yourself some great options that are easy to use and will last you for years and years. 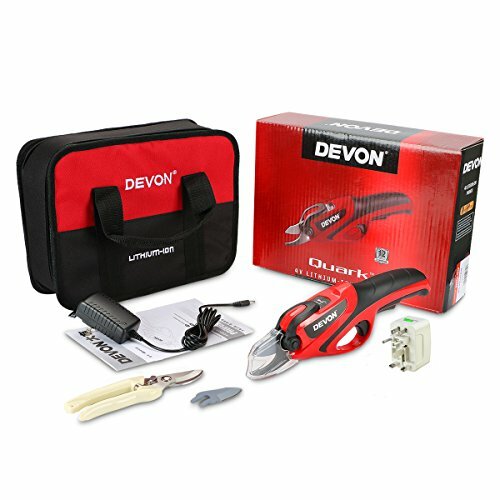 Say goodbye to frustration and contemplating just getting rid of your hedges entirely – these will change your yard work game forever.